Notre Dame: Aggressive defense on the perimeter against Oregon’s shooters. Oregon: Limit transition points after turnovers. Coaches are paid to worry. 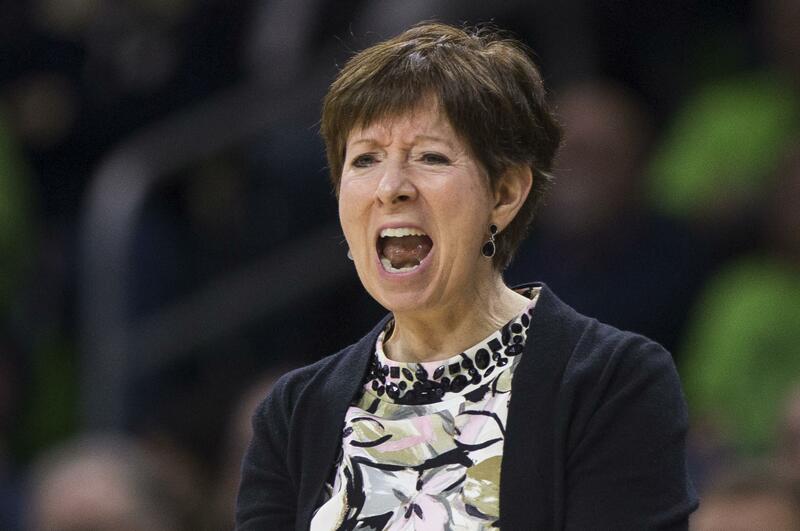 Notre Dame coach Muffet McGraw is fretting about her team’s defense on the 3-point line. Oregon’s Kelly Graves is stressing about rebounding. But for the fans who’ve paid to watch Monday night’s women’s NCAA Spokane Regional title game at the Arena? No worries. They’ll be treated to one of the most intriguing matchups of the season, as the top-seeded Fighting Irish (32-3) and two-seed Ducks (33-4) battle for a spot in the Final Four. Oregon brings the best perimeter offense in the country. Notre Dame counters with a physical frontcourt and a deadly transition game. The Ducks have depth; the Irish, not so much. “We’ll always try to use that to our advantage,” said Oregon coach Graves, who also has one of the top players in the country in sophomore guard Sabrina Ionescu. Together they’ve made a little history for a program that has very little of it. In four decades, Oregon has won 10 NCAA Tournament games; six have come in the last two years. “She’s definitely the key to their team, she makes everyone better,” McGraw said of Ionescu, perhaps the most versatile player in the game, a triple-double machine who has raised the bar for the Ducks and herself. McGraw hopes it doesn’t come on Monday, especially if the Ducks get hot outside. In dealing with a big run of injuries this year _ the Fighting Irish have just seven scholarship players _ they’ve had to make a major concession on defense. “We’re playing more bigs than we want to, which makes it even more difficult to guard the 3-point line,” McGraw said Sunday. The degree of difficulty will jump significantly on Monday: Oregon is the most accurate 3-point shooting team in the nation, hitting 40.6 percent this year. “This is going to be another challenge for us,” said McGraw, who felt the Irish didn’t defend the perimeter well in the first round against Villanova, another prolific 3-point shooting team. Oregon hopes to light it up with guards Lexi Bando (46.9 percent from long range) and Ionescu (44.2 percent). However, the Ducks will have to contend with Marina Mabrey, who drained seven 3-pointers Saturday in Notre Dame’s 90-84 win over Texas A&M. Oregon also must contend with a dominant Notre Dame frontcourt led by physical forwards Jessica Shepard and Kathryn Westbeld, who’ve helped the Irish to a 50.6 field-goal percentage that ranks third in the nation. Oregon answers with the athletic 6-4 Hebard, who went 11 of 16 against the CMU while finishing with 24 points and 14 rebounds. “She’s really a tough matchup because she’s able to score around the basket,” McGraw said. However, Oregon gave up 22 offensive boards against the Chippewas. “We can’t allow 22 offensive rebounds on Monday night or we’re going to get blown out,” Graves said. With nine Elite Eight appearances, Notre Dame also has an edge in big-game experience, though you wouldn’t know it after talking to the Ducks. Published: March 25, 2018, 7:05 p.m. Updated: March 25, 2018, 9:02 p.m.